We will miss the fall colors as we head east for a week or two. The city is an interesting place, but there is nothing there like the peace we find hiking in the open. The Girl and I are nearly done packing for the next trip. I have an interview in Denver and want to see Older Son and DiL. So, we’ll drive to Denver today and tomorrow, sit the interview, and then spend a few days with them. While there I’ll look up a couple of friends as well. The weather here in western Nevada has been, well, fall-like the last few days. Much water and energy blew over the Carson Range and brought bluster, clouds, and rain. Our outside time has been restricted because the weather has not been very inviting. I miss the sun already. The Nevada Day celebration was interesting. We walked the line of hot-air balloons as they prepared for the 0800 hours launch. But the ceiling was too low, so they called off the launch and the crews dismantled their aircraft. That was a pity. The Girl and I returned to the room for a bit then walked back over the Carson Street to see the parade. I met an old colleague there and we caught up as I interacted with his dog. Levi was a sweetheart, a red pibbie with a great personality and full of love. The Girl and Levi got along well. I was a bit puzzled by the heavy equipment that Carson City has in the Sheriff’s department. Some parts of law enforcement cross the line into para-military, it seems to me. The justification for that is difficult, especially in rural areas and small cities, like Carson. Perhaps there are things that I do not know that necessitate the use of military equipment (including assault rifles). But the irony of the situation was clear to me, as well as my colleague. After a few minutes, the Girl stood up and put her paws on my chest, looking directly into my eyes. She was ready to leave the noise and energy of the parade area. I acknowledged her request, but we stayed a bit longer. She asked me twice more to go. My colleague had wandered off to interact with friends, so the Girl and I turned east and returned to our room. Later in the day we walked a bit to take in the sun, which had come out about noon. The sun felt good on my body and the Girl and I really enjoyed our walk. Sunday was another messy day, regarding the weather. We (or rather I) packed up most of our things and began loading the rig. (The Girl snoozed most of the day.) Just after noon another gob of water and energy blew over the hill and it began to rain. By the time we left to visit Jimmy in Reno it was raining quite hard. On our way home I noticed snow on the Carson Range. The temperature had dropped with the pulse of weather as well. I’m looking forward to some road time. It looks like the weather will be good for the next few days, so I’m hopeful we’ll have some time to hike or walk as well. Then we’ll see what is next. 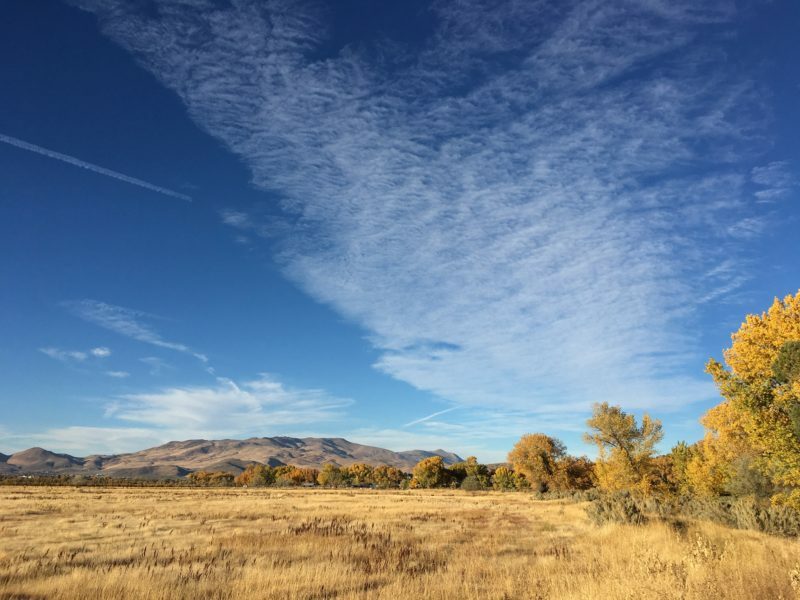 The Girl and I have enjoyed our fall walks along the Carson River Trail. The colors this fall were wonderful! The Girl and I got out this morning to walk and play a bit before I returned to my report. I have a draft report due today and it is my focus for the week. So, we did not take a long walk for the last few days, preferring to stay a little closer to the room. This morning we visited with human/doggie friends at the usual place. Just as we arrived, the wind came up, signaling a change in the weather. I looked outside a few minutes ago, intending to go walk, but it is raining. So, my walk will have to wait. The draft report was emailed to the prime contractor a few minutes ago. I have the afternoon to think about other things. The signal of new weather is normal for this time of year. I expect it to turn cooler over the next few weeks. Soon we will see a hard freeze and the resulting loss of the remaining leaves. The trees will release their leaves and don their winter clothing. I will miss the color but also will enjoy the dormant season with the skeletal images that come with winter outdoors. I will be here a few more days, then will head for Denver for a few days. I have a job interview there and will see my kids. Then I expect to return to Carson City to work while I wait on the results of the interview. I am looking forward to the trip to Colorado. I will take my favorite route. There will be a little pressure to get there, but I think there will still be time to play along the way. If the weather is good, the Girl and I will hike some. There will be photographs to make as well, I am certain. I think I will hit my storage unit before I go. I want to retrieve my winter hat (if I can find it) and maybe a couple of lenses to go with me. I have some things I can leave in my unit and lighten the load for this short trip. I think that when I return I will finally be able to begin the process of dealing with my storage units. I will either be moving into a place locally or will be moving remotely. But, either way, I will be able to begin the process of purging those things I no longer want/need and putting the remainder to work for me. This should be a video! We were playing in the park a few days ago and the Girl decided to put on a show. I laughed too much to make a video. 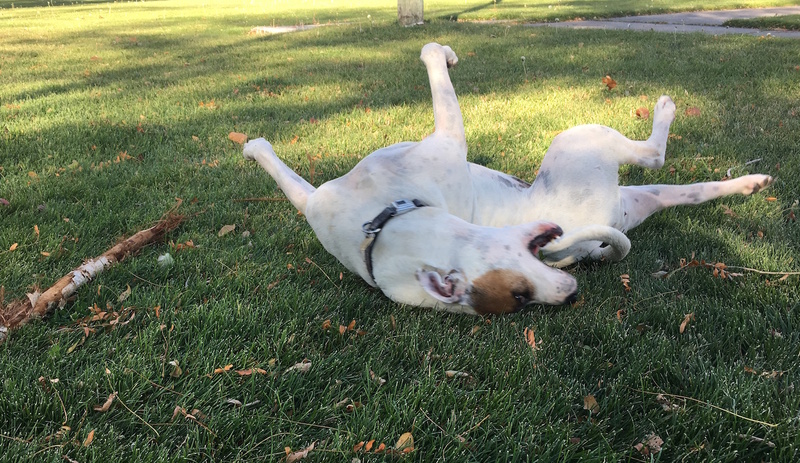 Pibbies have a reputation for putting on displays of incredible silliness. My favorite silliness of the Girl is what I call a zoomie. If one has been around dogs much, they know exactly what a zoomie is. If not, well then that is your loss, not mine. Suffice it to say that one must stay out of the way of the zooming canine or risk life and limb. We enjoy our walks (walkies) and go several times each day. Some days our walkies are much longer than others. On this particular afternoon, we walked across Stewart Street (taking our lives in my hands) and had a play over in the old Nevada State Children’s Home property. It’s mostly abandoned now, the structures used for storage I think. The grounds are home to a number of California ground squirrels (targets) and are visited often by neighborhood canines and their handlers. We know several good folks there. Good folks are fairly easily identified by their companions, who are also good folks. This particular afternoon I forgot to bring the Girl’s Chucker and ball — one of her favorite toys/games. So, we improvised with a branch blown from a nearby poplar by the recent winds. Pibbies will destroy branches. So, we had fun with this one, tugging and chasing for a half-hour or so. Then playtime was over and it was time for more serious pursuits. But the games are fun! The Girl and I have really enjoyed our Carson Trail hikes. With the recent rains and cessation of irrigation, there is more water in the Carson River. The Girl and I have been walking the Carson River Trail quite a lot the last few weeks. There’s less traffic than at Riverview Park and I like the walk along the river a bit better. Friday we walked the trail again. The colors are staggering for the moment. Soon enough, it will all be gone and the cottonwoods will be in their winter dress. But for now, I’m really enjoying the color. We paused at Mexican Dam for a few minutes. The flow is up quite a lot with the recent rains and the ending of irrigation season. But, there is not a lot of flow. I stood there, looking over the water and taking in the sights, sounds, and smells. I heard a splash nearby and turned to see the Girl in the water. How she fell off the headgate wall I’ll never know. She’s not the brightest bulb in the box, sometimes. She reinforced my observation by trying to climb up the concrete headwall. Unsuccessful, she looked at and I called her toward me. She could walk out on the weir. She dogpaddled toward me and tried to climb the wall again. She slipped back into the water and went under. That didn’t look good. She didn’t look panicked, but was clearly distressed. I called her to me again. She swam my way and tried to climb out again. For a moment, I thought I was going to have to jump into the river and rescue my dog. That would have meant wetting my iPhone and my watch, which would have been expensive (but I didn’t think of that at the time). But, she swam a little closer and I reached down to her. I snagged her collar and hoisted while she scrambled up the rough concrete. Wet but happy, she shook and gave me a shower. I laughed, retrieved my pack, and we headed back to the rig, where I had a towel. On the way back, she had two or three mini-zoomies and we played. She was a happy dog and I was a happy man. At the rig, I retrieved the towel and wiped her mostly-dry fur down. She likes the towel. I like the Girl. 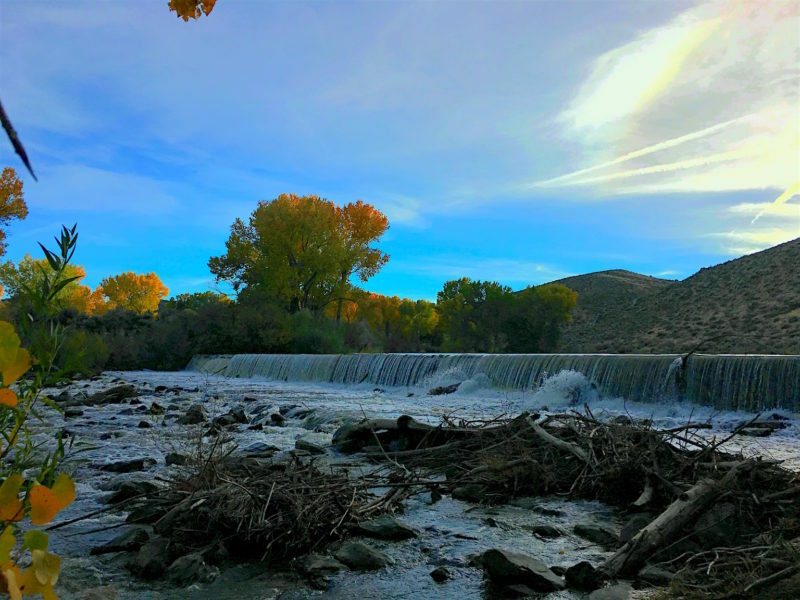 I think I’ll never tire of walking out to Mexican Dam, especially now that the Carson River flows are increasing. The night before last was a blustery fall night. It rained off and on as the westerly winds blew moisture over the Carson Range and into the valleys east of the Sierra Nevada. The fan in my room’s HVAC unit mitigated the normal affect wind might have on my sleep — restless — which was good. So I slept fairly well even with the wind and rain. When we left the room, there was a bit of sun for a cool fall morning. So we walked over to the old orphanage, interacted with some friends and acquaintances, and played with the ball a bit. We then returned to the room so I could feed us and take care of my Saturday-morning chores. But I soon became restless. I wanted some outside time, even if the wind was up. So the Girl and I headed out to Silver Saddle Ranch for a walk and a look at the Carson River. We took a slightly different route than recently to add a little variety. But ultimately if one wants to walk to the Mexican Dam, there is the Mexican Ditch maintenance road to walk. The slope west from the ditch to a little rough to walk. It can be done and we’ve done it, but the footing is treacherous in places and it’s not worth the risk of a serious spill. So I walk the road. The wind did not yet take the leaves. Some of the old cottonwoods still cling to their green as well. They will be the holdouts, waiting until the last moment to shed for the winter. For me, that means a few more days of fall color opportunity before the winter colors arrive. I’m carrying my compact camera in-hand more and need to download those images for processing. I could hear the Carson River flow over Mexican Dam before we reached the site. Even with the white noise of wind in the trees I could hear the water’s pitch. Glimpses of white air entrainment were visible through gaps in the trees as we approached. Sure enough, more flow is crossing Mexican Dam. It isn’t a lot more, but it’s noticeable and I suspect measurable. There was enough rain in the watershed to boost the discharge slightly. The Girl and I walked out onto the weir. She tried to drink and managed a few sips before a whitecap smacked her nose, causing her to jump back. Nonplussed, she tried a couple more times as we puttered along the west bank of the river. There’s plenty of dry driftwood for me to make a fire if I need to. I realize that I should carry my folding saw in my pack as well as the tiny saw on my multitool. “Two is one and one is none…” If I needed to make a small fire, I’d better have some additional tools in the kit. I have a tarp (cover) and cordage for my pack as well. I think I’ll spend a little time this week to assemble those items and get them into my pack. They should be part of my EDC system anyway. We turned away to walk back to the rig and return home. Clouds darkened the western sky as the continued winds blew more energy and moisture over the Carson Range. I knew we’d see more rain that afternoon. Even if it was only a couple of miles back to the rig, those could be pretty miserable miles in the wet without cover. I’m so thankful that I can get out like this. I love being outside, walking, listening to the world about me. The Girl adds a unique element to the experience with her completely different perception of the world. Sharing that with her is good and I’ve grown because of it. Back at our room, tired and ready for food, I cleaned up while the Girl napped. Her breathing and soft energy was too tempting and so I rolled up in my blanket next to her for a nap and a snuggle. There is something about having another living being in my life that expands my perception. That we share much experience from our totally different perspectives fascinates and astounds me. Sure enough, I woke to a blustery light rain. That’s typical fall weather in western Nevada. There will be snow in the mountains and that’s a good thing for it is water for next year. Soon we’ll have colder days and harder light. With another layer of clothing and perhaps a jacket for the Girl, we’ll be good to go and be out and about on cold winter mornings, enjoying life outdoors. Over the last few days, I noticed the flow in Carson River increased. 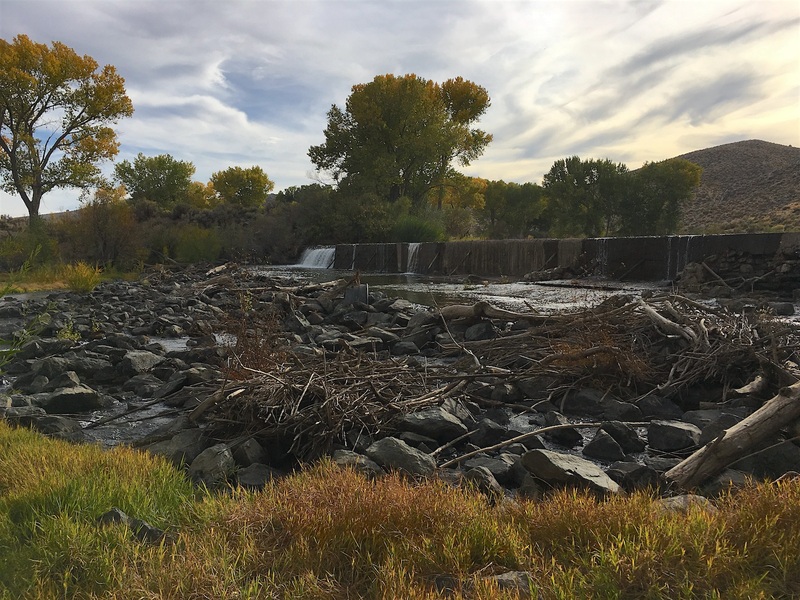 Irrigation season is ended and flows are being restored to the Carson River. This was a difficult shot, technically. The dynamic range from the darkest shadow to the brightest highlight was too much for the sensor in my iPhone 6S. I made the shot anyway, knowing the technical problem. I used an application that captures data directly from the sensor in TIF encoding. I then post-processed the image on my MacBook Pro, but not using anything too fancy… just the Preview application and the simple tools it provides. The end result is not stellar, but it conveys the mood of the time of the shot. The Girl and I are enjoying our daily outings along the Carson River. The trail from the staging area (River Park) to the Mexican Dam is almost flat and is about a mile and a half one way. There are wonderful views of the riparian area and the sagelands adjacent to them. Silver Saddle Ranch is west from the river/trail and it is still a working ranch. So it changes with the season too. With the end of irrigation season (about the first of October), pressure on Carson River flows eases and the river begins its winter recovery. Reduced demand for water permits flows from the uplands to propagate downstream and recharge of the alluvial aquifer (bank storage) begins. As the alluvial aquifer moves toward equilibrium, more flow stays in the river and reaches Mexican Dam (and other parts downstream). In the couple of weeks since irrigation ceased, I observed an increase in flow at Mexican Dam. In September I noticed where irrigators placed a few sandbags to direct the meager flow to the headgate of Mexican Ditch. 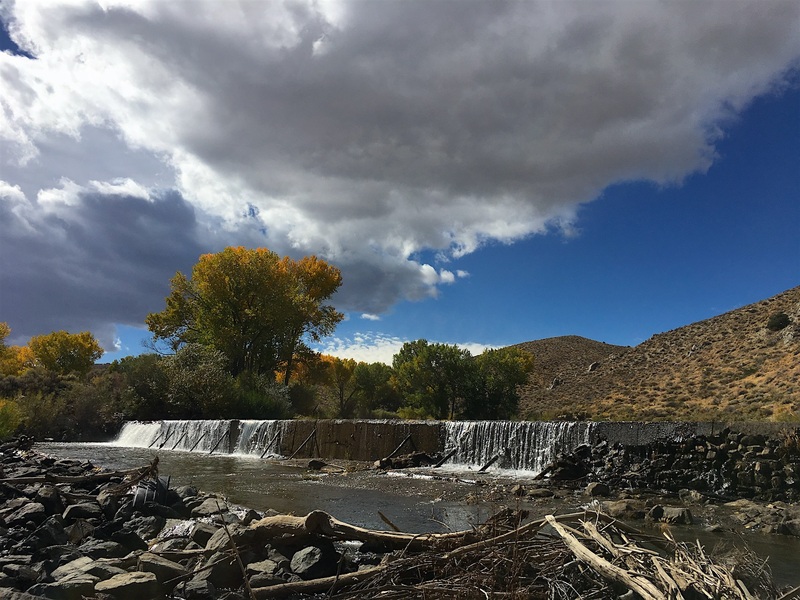 Flow in Carson River was through Mexican Dam and its abutments or through Mexican Ditch to be returned downstream. Now there is flow over Mexican Dam. It isn’t much, but it is there and it is measurably greater than two weeks ago. If the rain we are promised occurs this weekend, then I’m betting next week there will be more flow in the river. If so, I’ll notice it. There is something in me that observes. I am driven to just look at the world around me as I pass through it. I notice things, particularly when I pass by them multiple times. Change, in particular, captures my attention. Because I remain fascinated by water and its motion, I am particularly sensitive to changes in water dynamics when I see them. Sometimes, those observations are interesting enough to capture with a camera. This fall I wish I was skilled with videography and had a drone. I think that an interesting short film could be produced of the Carson River corridor where I walk almost every day. But, I am neither skilled with videography nor do I have a drone. So, that is not happening. 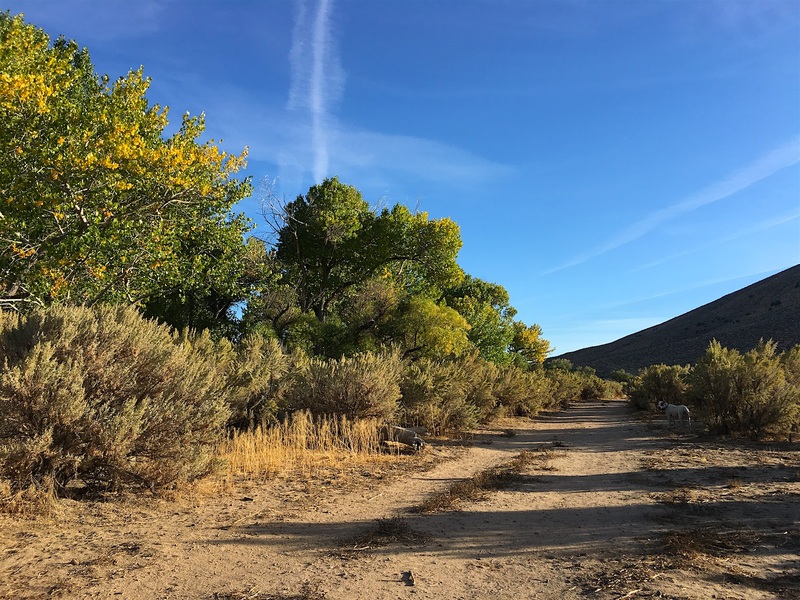 Instead, I find myself capturing still images of the beauty of the Carson River corridor and posting them here along with my ruminations of what I observed. This is interesting, to me at least. As the seasons change, my observations of the river will continue. I expect they will also change. In part that will be attributable to the changing season, but also I will change. I also expect that my range will increase as I find new trails to work with the Girl. I’m actually looking forward to winter. I love walking in the cold, crisp air (with warm clothing). The hardness of winter light fascinates me. The bit of snow we’ll have here in the valleys of Nevada will add a touch of interest to the landscape. There will be fewer people out walking the trails as well. The heat and taste of coffee or tea after the walk is such a pleasant experience. On the way home from South Lake Tahoe yesterday, the Girl and I stopped for a walk along the West Carson River. My meeting in South Lake Tahoe went well yesterday. On the way home, I elected to drive over Luther Pass (California SH 89) and into Hope Valley. My hope (pun intended) was that I might see the aspens before the winds take their leaves. My hope (again pun intended) was that the light would be good enough to make a few captures of the fall color. Alas, the sky was too hazy for the light to be good. But the leaves are still there (perhaps until the winds this weekend) and the view was breathtaking. That was good. We stopped at the little roadside park just west from the SH88/89 intersection. The lot was crowded with passersby (as always), but there was a place to park the rig. So, I retrieved my X-T1 from the back, got the Girl off her perch, and locked the rig. We walked the few dozen yards to West Fork Carson River. We encountered only a couple other walkers. The river burbled along the channel, pushing against the rocks in its path. The Girl hunted squirrels and lizards (but found none). I enjoyed the cool air, the sound of the breeze in the pines, the sound of the river moving along, and the sounds the Girl makes as she snuffles about. Some yards away I heard an older couple playing with their retriever in the water. The calls of the man and the splashing of the dog added a pleasant counterpoint to the susurrations of wind and water. The Girl, of course, noticed none of these things… or at least did not acknowledge them as important to her world. Her world comprises the world of sight and scent, which is a completely alien worldview to my own. Yet, these seem complementary as we enjoy many of the same things and enjoy them together. The worlds of man and dog intersect along our boundary of life and energy and we share much. What would my life be without this Girl in it? I am not completely sure, but I am sure that it would be poorer without her. As I said long ago (and will likely repeat), I think we rescued each other — we are both rescue animals, each from a different place, a different species, a different tribe, but rescues nonetheless. We wrapped up our respective reveries as we headed back to the rig to travel down the hill and to our (temporary) home. She curled up in the seatpan (bun warmer on) and I drove us down the valley back into Nevada. 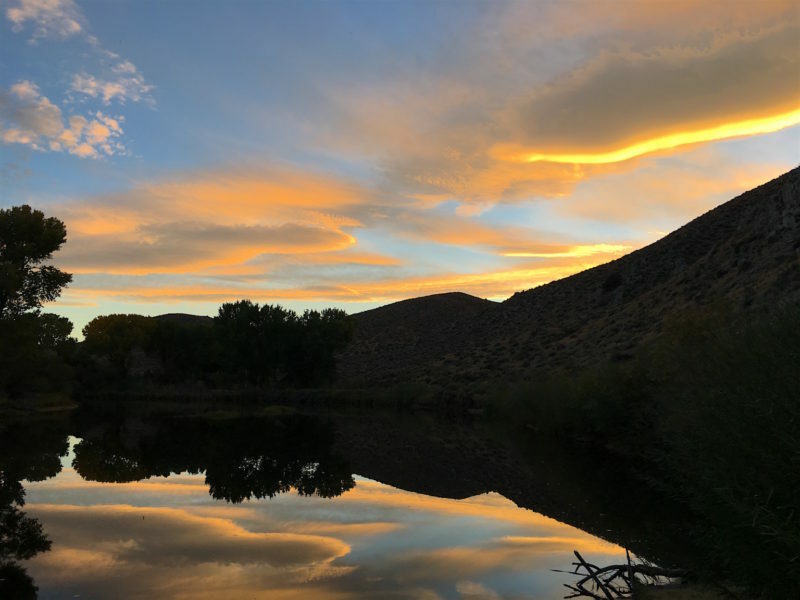 A couple of evenings ago, the Girl and I saw this beautiful sunset at Mexican Dam on the Carson River. Every now and again western Nevada offers an absolutely stunning sunset. The conditions have to be right, with a few clouds and little haze. There are many sunsets here that are beautiful, but simple, with the sun setting behind the Carson Range, leaving the day in a blaze of beautiful red but with no clouds to share in that color. Then again, we have those evenings when we are blessed with a few clouds to share in the parting of the day. When those special evenings occur, they can be stunning. 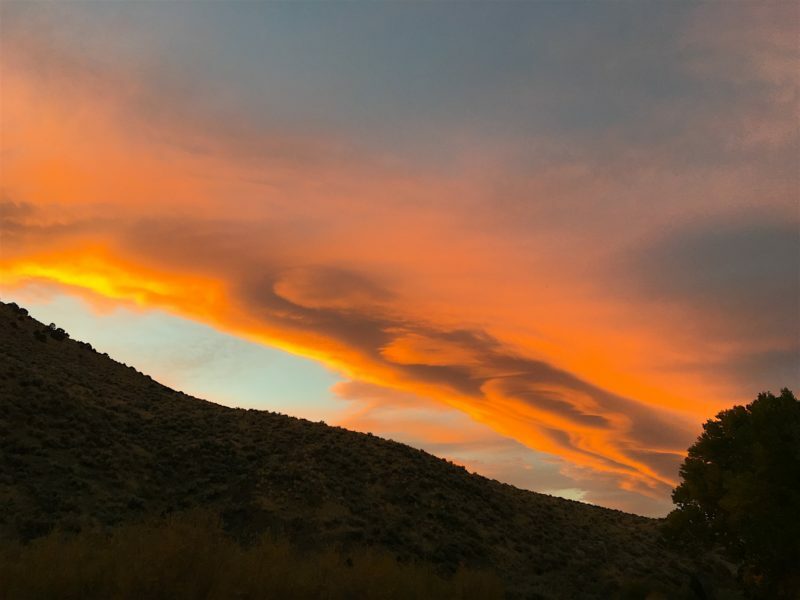 So, when the Girl and I were on evening walkies along the Carson River Trail a few evenings ago, we were in for a double treat. With the end of irrigation season, there is a little more water in the Carson River. Flows are just enough that water is flowing over Mexican Dam again… just a little. But, it’s enough that there is a small pond behind the weir. Ducks, geese, and a blue heron are often seen here. I laugh when we jump ducks from the Mexican Ditch on the way to the Mexican Dam. They burst from the ditch and cover, beating the water and brush with the wings, quacking their duck-curses upon us. The Girl gives chase for a few steps, then realizes she will not catch the swift flyers. This particular evening was no different. At the dam, the light was turning special. There was enough water to provide a reflection of the sunset. So we stayed a few minutes to take it in. I made a few captures with my iPhone and my compact camera and drank a little water while the Girl snuffled about. Then it was off for the rig to beat the dusk. I knew I pushed it a little, not really wanting to hike back to the rig in the dark. I carry a small light (enough) and think I’ll put a headlight in my pack for those evenings when we just don’t get back to the rig before dark. On the way back to the rig, the Great Horned Owls began their evening calls. I heard three of them, announcing their presence to each other, preparing the the evening hunts. I called back as I hiked, looking for their telltale shapes on the darkening branches of the cottonwoods. 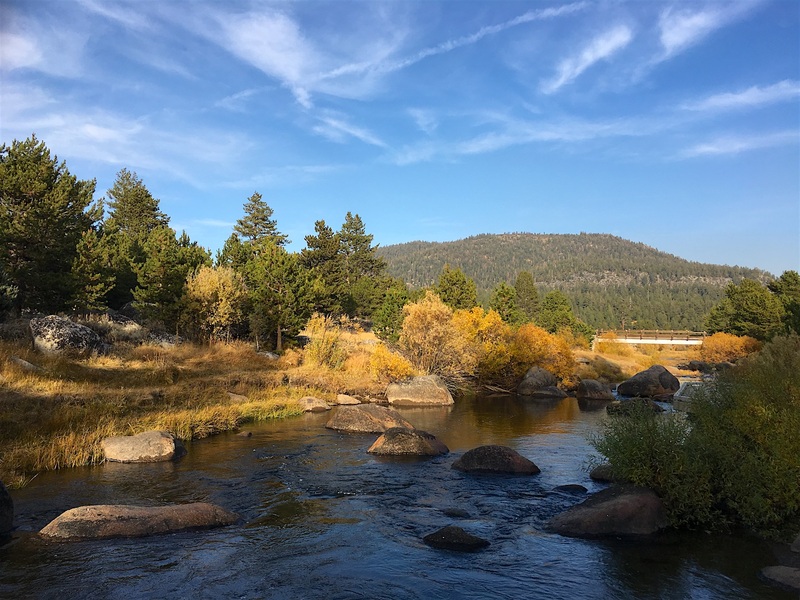 None revealed themselves that evening, and I was left with the sounds of their calls, the crunching of the sand under my boots, the burbling of the Carson River over its riffles, and the snuffling of the Girl as we humped it back to the rig. We flushed no ducks on the way back. We did encounter one other pair of hikers working their way toward Mexican Dam. I think they were too late for the sunset, but perhaps that was not their objective. Back at the rig in the gathering dusk, the Girl hopped in and waited for me to close the door. I shucked my pack, stowed it, and closed her door. Then it was off to our room for supper and to relax from the hike. On walkies with the Girl, we were treated with a gorgeous Carson River sunset. Yesterday evening the Girl and I got away from the hotel a bit later than I intended. Yet, I wanted to get to the staging area when the light was good. The Carson River cottonwoods are beginning to look really pretty. It’s likely that the color will last only a few days. The weather is supposed to change later this week and the wind might very well take the leaves and leave us (pun intended) with the cottonwood’s winter color. We’ve been blessed with beautiful fall weather the last few days. Walking late in the afternoon is warm but not hot. The beauty of the afternoon light compensates for the sweaty back I get from carrying a pack along with me. I took my compact camera along with me yesterday afternoon and will download the frames later today. In the meantime, I’ll share this one from the trip back from Mexican Dam. The sun quickly dropped behind Prison Hill, so named for the rock mined for the prison and other government buildings in Carson City. In the shadow of the hills, the owls began their evening calls. I heard at least three of them, but never spotted one. Nonetheless, I smiled and thanked God for sharing that experience with me. The view at Mexican Dam was stunning. The Carson River waters are rising with the end of irrigation season. Water now flows over the weir whereas a few days ago it did not. The sound provided a counterpoint to the reflected light on the surface of the small impoundment as I paused to make a few images before we headed back to the rig. On the way back to the rig, we were treated to the illumination of this wave cloud as the sun drifted lower behind the Carson Range. The sight gave me pause to pray a bit, thanking God (again) for this beautiful evening as I listened to the crunch of the coarse sand beneath my boots, the huffing and snuffling of the Girl, and the hooting of owls in the distance. It was a happy closing to a good day — a day I gave myself off from the project before me. I’ll pick up the thread again today and get the work done because it’s time to get it done. But I have the memory of that gorgeous walk last night and the captures in my camera to reflect on. There will be more walks and more photographs, I think. This is good. Over the last few days, the Girl and I have been making walkies later in the day. Part of the reason is that it’s warmer in the afternoon. Mornings are much cooler these days. Fall arrived in Carson City, Nevada a week or so ago. Even with the cool weather, some mornings the Girl and I get out early anyway. With a light base layer, I’m plenty warm. (She only gets cold if she’s still. But I’ll get her a jacket soon anyway.) But my preference on cooler days is to walk in the afternoon when the light is pretty. 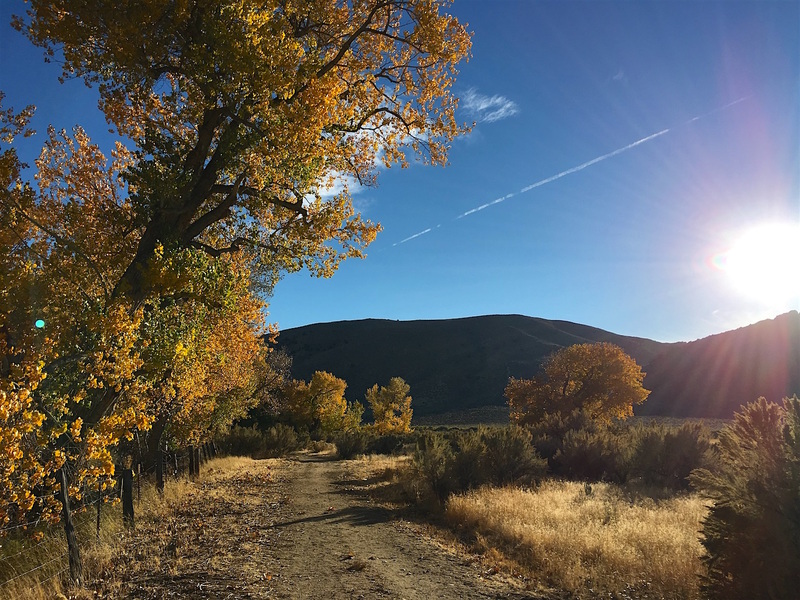 The cottonwoods along the Carson River are showing their fall colors. That makes a beautiful hike even better. So we’re taking advantage of the warm afternoons and beautiful fall colors to make the ending of the day special.